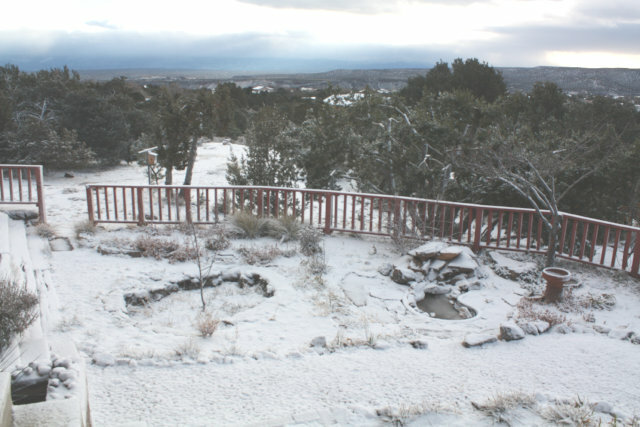 The snowy days here have been so pretty, the snow contrasting with the darkness of the piñons and junipers and the black basalt. The light fluffy crystals sparkle in a rainbow of colors when they catch the sunlight at the right angle, but I've been unable to catch that effect in a photo. We've had some unusual holiday visitors, too, culminating in this morning's visit from a huge bull elk. Dave came down to make coffee and saw the elk in the garden right next to the window. But by the time I saw him, he was farther out in the yard. And my DSLR batteries were dead, so I grabbed the point-and-shoot and got what I could through the window. Fortunately for my photography the elk wasn't going anywhere in any hurry. He has an injured leg, and was limping badly. He slowly made his way down the hill and into the neighbors' yard. I hope he returns. 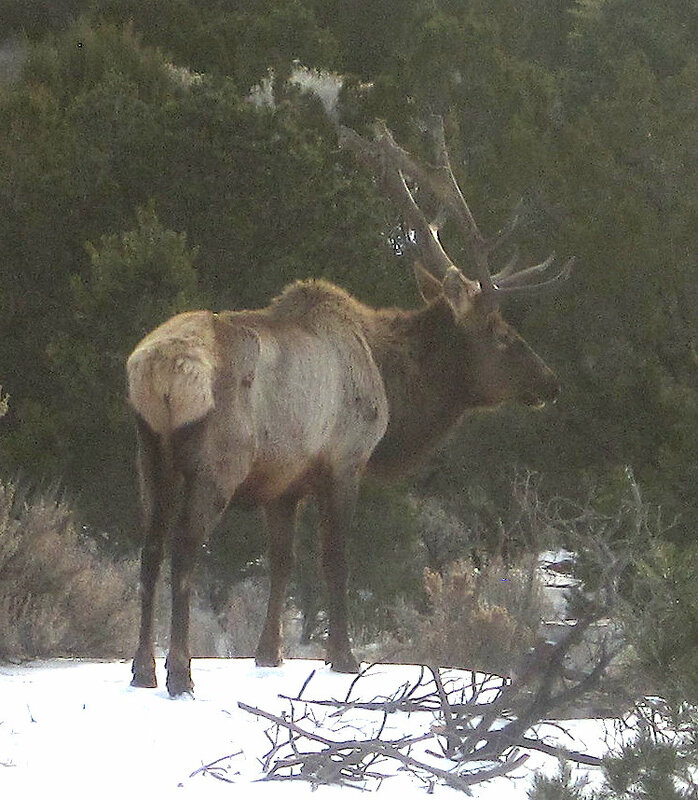 Even with a limp that bad, an elk that size has no predators in White Rock, so as long as he stays off the nearby San Ildefonso reservation (where hunting is allowed) and manages to find enough food, he should be all right. I'm tempted to buy some hay to leave out for him. Some of the sunsets have been pretty nice, too. Excellent Xmas to all! We're having a white Xmas here..
Dave and I have been discussing how "Merry Christmas" isn't alliterative like "Happy Holidays". We had trouble coming up with a good C or K adjective to go with Christmas, but then we hit on the answer: Have an Excellent Xmas! It also has the advantage of inclusivity: not everyone celebrates the birth of Christ, but Xmas is a secular holiday of lights, family and gifts, open to people of all belief systems. Meanwhile: I spent a couple of nights recently learning how to photograph Xmas lights and farolitos. Farolitos, a New Mexico Christmas tradition, are paper bags, weighted down with sand, with a candle inside. Sounds modest, but put a row of them alongside a roadway or along the top of a typical New Mexican adobe or faux-dobe and you have a beautiful display of lights. They're also known as luminarias in southern New Mexico, but Northern New Mexicans insist that a luminaria is a bonfire, and the little paper bag lanterns should be called farolitos. They're pretty, whatever you call them. 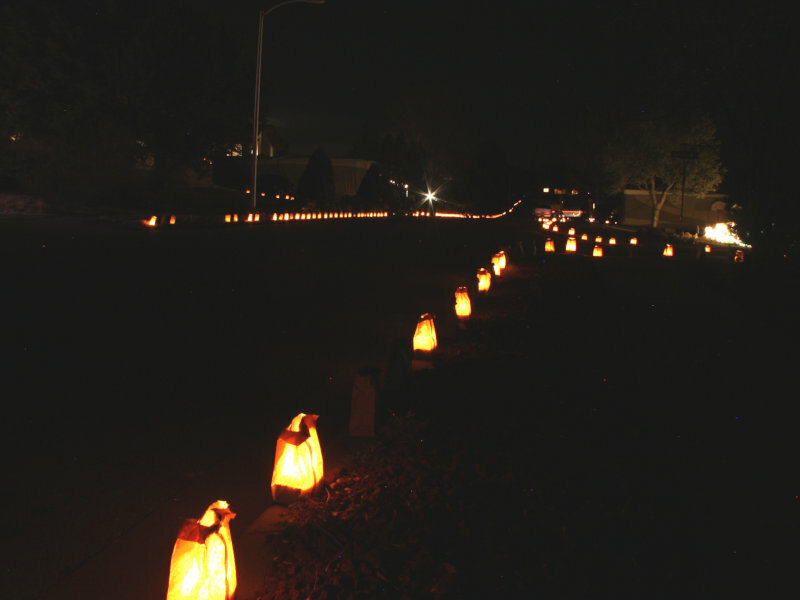 Locally, residents of several streets in Los Alamos and White Rock set out farolitos along their roadsides for a few nights around Christmas, and the county cooperates by turning off streetlights on those streets. The display on Los Pueblos in Los Alamos is a zoo, a slow exhaust-choked parade of cars that reminds me of the Griffith Park light show in LA. But here in White Rock the farolito displays are a lot less crowded, and this year I wanted to try photographing them. I have a little past experience with night photography. I went through a brief astrophotography phase in my teens (in the pre-digital phase, so I was using film and occasionally glass plates). But I haven't done much night photography for years. That's partly because I've had problems taking night shots with my current digital SLRcamera, a Rebel Xsi (known outside the US as a Canon 450d). It's old and modest as DSLRs go, but I've resisted upgrading since I don't really need more features. Except maybe when it comes to night photography. I've tried shooting star trails, lightning shots and other nocturnal time exposures, and keep hitting a snag: the camera refuses to take a photo. I'll be in Manual mode, with my aperture and shutter speed set, with the lens in Manual Focus mode with Image Stabilization turned off. Plug in the remote shutter release, push the button ... and nothing happens except a lot of motorized lens whirring noises. Which shouldn't be happening -- in MF and non-IS mode the lens should be just sitting there intert, not whirring its motors. I couldn't seem to find a way to convince it that the MF switch meant that, yes, I wanted to focus manually. It seemed to be primarily a problem with the EF-S 18-55mm kit lens; the camera will usually condescend to take a night photo with my other two lenses. I wondered if the MF switch might be broken, but then I noticed that in some modes the camera explicitly told me I was in manual focus mode. I was almost to the point of ordering another lens just for night shots when I finally hit upon the right search terms and found, if not the reason it's happening, at least an excellent workaround. I'm so sad that I went so many years without knowing about Back Button Focus. It's well hidden in the menus, under Custom Functions #10. Normally, the shutter button does a bunch of things. When you press it halfway, the camera both autofocuses (sadly, even in manual focus mode) and calculates exposure settings. The text before the slash indicates what the shutter button, pressed halfway, will do in that mode; the text after the slash is what happens when you press the * or AE lock button on the upper right of the camera back (the same button you use to zoom out when reviewing pictures on the LCD screen). 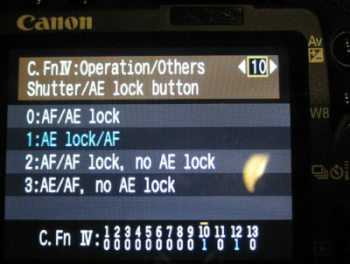 The first option is the default: press the shutter button halfway to activate autofocus; the AE lock button calculates and locks exposure settings. The second option is the revelation: pressing the shutter button halfway will calculate exposure settings, but does nothing for focus. To focus, press the * or AE button, after which focus will be locked. Pressing the shutter button won't refocus. This mode is called "Back button focus" all over the web, but not in the manual. Back button focus is useful in all sorts of cases. For instance, if you want to autofocus once then keep the same focus for subsequent shots, it gives you a way of doing that. It also solves my night focus problem: even with the bug (whether it's in the lens or the camera) that the lens tries to autofocus even in manual focus mode, in this mode, pressing the shutter won't trigger that. The camera assumes it's in focus and goes ahead and takes the picture. Incidentally, the other two modes in that menu apply to AI SERVO mode when you're letting the focus change constantly as it follows a moving subject. The third mode makes the * button lock focus and stop adjusting it; the fourth lets you toggle focus-adjusting on and off. There's one other thing that's crucial for night shots: live view focusing. Since you can't use autofocus in low light, you have to do the focusing yourself. But most DSLR's focusing screens aren't good enough that you can look through the viewfinder and get a reliable focus on a star or even a string of holiday lights or farolitos. Instead, press the SET button (the one in the middle of the right/left/up/down buttons) to activate Live View (you may have to enable it in the menus first). The mirror locks up and a preview of what the camera is seeing appears on the LCD. Use the zoom button (the one to the right of that */AE lock button) to zoom in; there are two levels of zoom in addition to the un-zoomed view. You can use the right/left/up/down buttons to control which part of the field the zoomed view will show. Zoom all the way in (two clicks of the + button) to fine-tune your manual focus. Press SET again to exit live view. It's not as good as a fine-grained focusing screen, but at least it gets you close. Consider using relatively small apertures, like f/8, since it will give you more latitude for focus errors. Yyou'll be doing time exposures on a tripod anyway, so a narrow aperture just means your exposures have to be a little longer than they otherwise would have been. After all that, my Xmas Eve farolitos photos turned out mediocre. We had a storm blowing in, so a lot of the candles had blown out. (In the photo below you can see how the light string on the left is blurred, because the tree was blowing around so much during the 30-second exposure.) But I had fun, and maybe I'll go out and try again tonight. An excellent X-mas to you all! 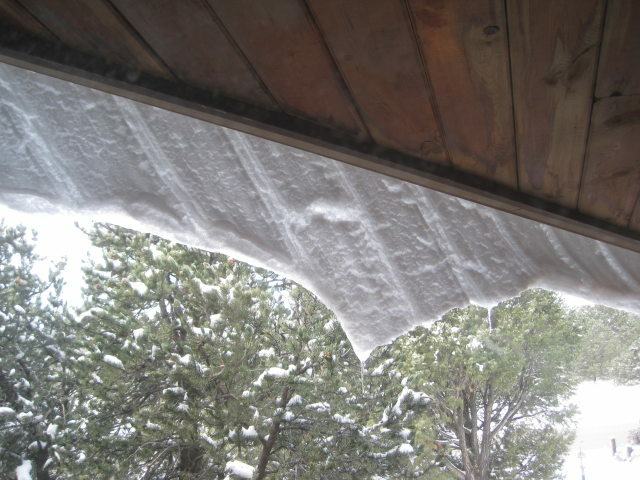 The day after I posted that, I had a chance to see what happens as the snow sheet slides off a roof if it doesn't have a long distance to fall. It folds gracefully and gradually, like a sheet. The underside as they slide off the roof is pretty interesting, too, with varied shapes and patterns in addition to the imprinted pattern of the roof. But does it really move like a glacier? I decided to set up a camera and film it on the move. I set the Rebel on a tripod with an AC power adaptor, pointed it out the window at a section of roof with a good snow load, plugged in the intervalometer I bought last summer, located the manual to re-learn how to program it, and set it for a 30-second interval. I ran that way for a bit over an hour -- long enough that one section of ice had detached and fallen and a new section was starting to slide down. 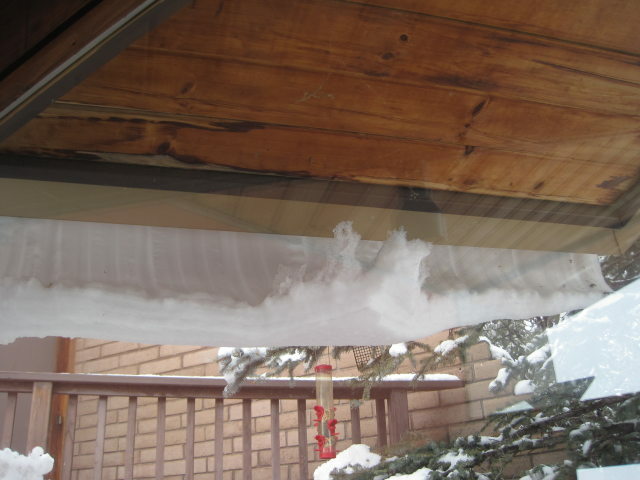 Then I moved to another window and shot a series of the same section of snow from underneath, with a 40-second interval. I uploaded the photos to my workstation and verified that they'd captured what I wanted. But when I stitched them into a movie, the way I'd used for my time-lapse clouds last summer, it went way too fast -- the movie was over in just a few seconds and you couldn't see what it was doing. Evidently a 30-second interval is far too slow for the motion of a roof glacier on a day in the mid-thirties. In avconv, -r specifies a frame rate for the next file, input or output, that will be specified. So -r 3 specifies the frame rate for the set of input images, -i 'img_%04d.jpg'; and then the later -r 30 overrides that 3 and sets a new frame rate for the output file, -timelapse.mp4. The start number is because the first file in my sequence is named img_8252.jpg. 30, I'm told, is a reasonable frame rate for movies intended to be watched on typical 60FPS monitors; 3 is a number I adjusted until the glacier in the movie moved at what seemed like a good speed. The movies came out quite interesting! The main movie, from the top, is the most interesting; the one from the underside is shorter. I wish I had a time-lapse of that folded sheet I showed above ... but that happened overnight on the night after I made the movies. By the next morning there wasn't enough left to be worth setting up another time-lapse. 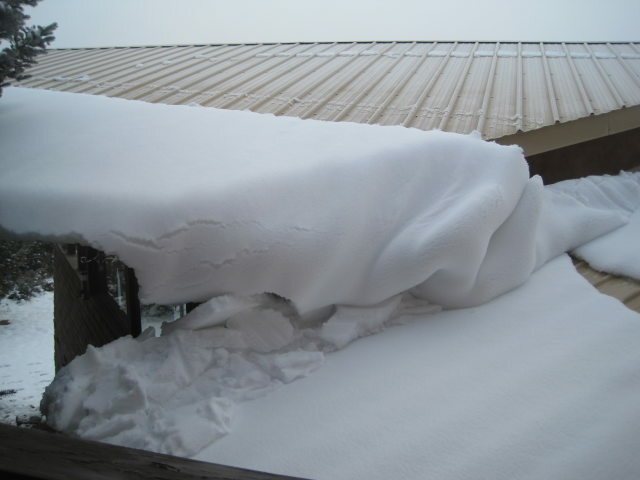 But maybe one of these years I'll have a chance to catch a sheet-folding roof glacier. The wonderful summer thunderstorm season here seems to have died down. But while it lasted, we had some spectacular double rainbows. And I kept feeling frustrated when I took the SLR outside only to find that my 18-55mm kit lens was nowhere near wide enough to capture it. I could try stitching it together as a panorama, but panoramas of rainbows turn out to be quite difficult -- there are no clean edges in the photo to tell you where to join one image to the next, and automated programs like Hugin won't even try. 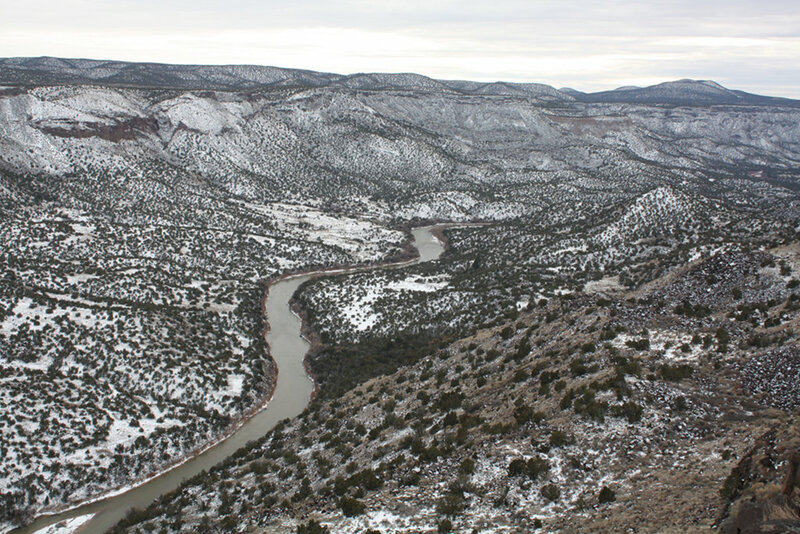 There are plenty of other beautiful vistas here too -- cloudscapes, mesas, stars. Clearly, it was time to invest in a wide-angle lens. But how wide would it need to be to capture a double rainbow? 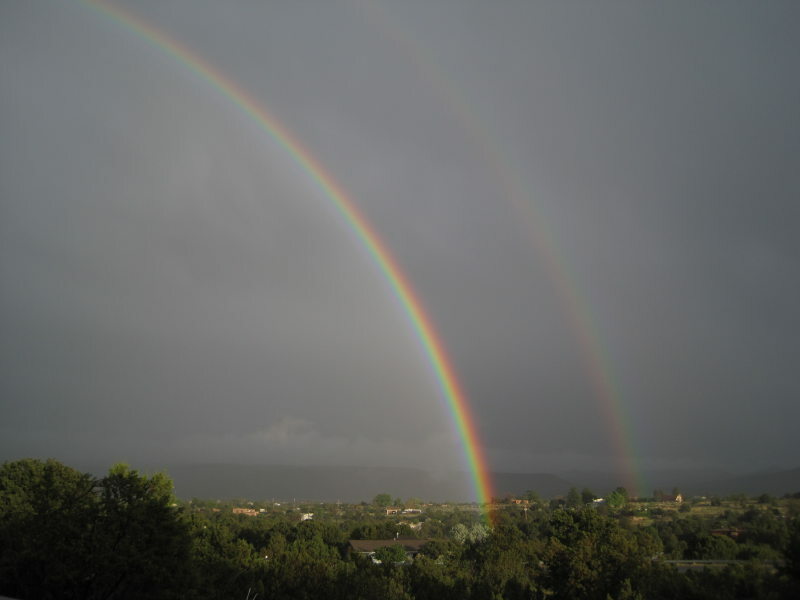 All over the web you can find out that a rainbow has a radius of 42 degrees, so you need a lens that covers 84 degrees to get the whole thing. But what about a double rainbow? My web searches came to naught. Lots of pages talk about double rainbows, but Google wasn't finding anything that would tell me the angle. I eventually gave up on the web and went to my physical bookshelf, where Color and Light in Nature gave me a nice table of primary and secondary rainbow angles of various wavelengths of light. It turns out that 42 degrees everybody quotes is for light of 600 nm wavelength, a blue-green or cyan color. At that wavelength, the primary angle is 42.0° and the secondary angle is 51.0°. Armed with that information, I went back to Google and searched for double rainbow 51 OR 102 angle and found a nice Slate article on a Double rainbow and lightning photo. The photo in the article, while lovely (lightning and a double rainbow in the South Dakota badlands), only shows a tiny piece of the rainbow, not the whole one I'm hoping to capture; but the article does mention the 51-degree angle. Notice that while the primary angles get smaller with shorter wavelengths, the secondary angles go the other way. That makes sense if you remember that the outer rainbow has its colors reversed from the inner one: red is on the outside of the primary bow, but the inside of the secondary one. 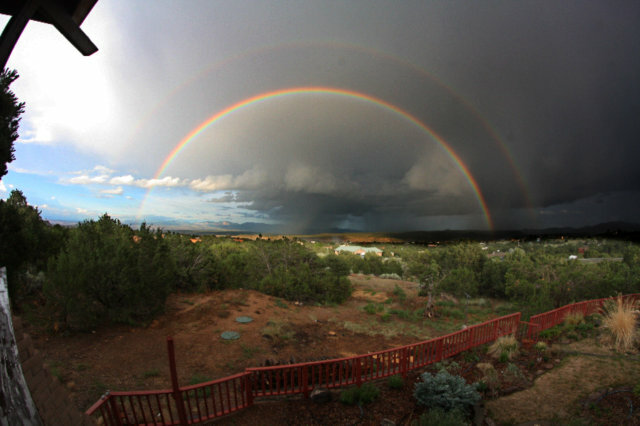 So if I want to photograph a complete double rainbow in one shot, I need a lens that can cover at least 108 degrees. What focal length lens does that translate to? Howard's Astronomical Adventures has a nice focal length calculator. If I look up my Rebel XSi on Wikipedia to find out that other countries call it a 450D, and plug that in to the calculator, then try various focal lengths (the calculator offers a chart but it didn't work for me), it turns out that I need an 8mm lens, which will give me an 108° 26‘ 46" field of view -- just about right. 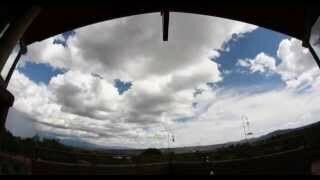 So that's what I ordered -- a Rokinon 8mm fisheye. And it turns out to be far wider than I need -- apparently the actual field of view in fisheyes varies widely from lens to lens, and this one claims to have a 180° field. So the focal length calculator isn't all that useful. At any rate, this lens is plenty wide enough to capture those double rainbows, as you can see. By the way, that book I linked to earlier is apparently out of print and has become ridiculously expensive. Another excellent book on atmospheric phenomena is Light and Color in the Outdoors by Marcel Minnaert (I actually have his earlier version, titled The Nature of Light and Color in the Open Air). Minnaert doesn't give the useful table of frequencies and angles, but he has lots of other fun and useful information on rainbows and related phenomena, including detailed instructions for making rainbows indoors if you want to measure angles or other quantities yourself. On Linux Planet yesterday: an article on how to write scripts for chdk, the Canon Hack Development Kit -- Part 3 in my series on CHDK. I found that CHDK scripting wasn't quite as good as I'd hoped -- some of the functions, especially the aperture and shutter setting, were quite flaky on my A540 so it really didn't work to write a bracketing script. But it's fantastic for simple tasks like time-lapse photography, or taking a series of shots like the Grass Roots Mapping folk do. If you're at OSCON and you like scripting and photos, check out my session on Thursday afternoon at 4:30: Writing GIMP Plug-ins and Scripts, in which I'll walk through several GIMP scripts in Python and Script-Fu and show some little-known tricks you can do with Python plug-ins. Perhaps equally important, it discusses how to access these modes and CHDK's other special menus, how to load CHDK automatically whenever you power the camera on, and how to disable it temporarily. Part 3, yet to come, will discuss how to write CHDK scripts.